Fifty agronomic crop farmers implement a cropping system management change to optimize soil C-N-P dynamics on 5,000 acres, increasing soil C by 5 tons/acre in the long-term while reducing nitrate-N leaching by 12 lbs/acre/yr and P runoff by 1 lbs/acre/yr (a 50% reduction of both). Agricultural soils in the Chesapeake Bay watershed are losing an average of 2 lbs/ac/yr phosphorus (P) in runoff water and 23 lbs/ac/yr N in nitrate leaching, causing severe water quality issues in the Bay. At the same time, soil carbon (C) levels are declining by 95 lbs/ac/yr, negatively impacting soil health and contributing to global climate change. Elemental C-N-P cycles are inextricably linked through the process of growing crops, feeding livestock, and applying manure to agricultural lands, but optimizing the management of these cycles to achieve high soil C levels while minimizing N and P losses is fraught with tradeoffs in heavily concentrated areas of livestock production. This project will engage agronomic crop farmers in Pennsylvania, New York, and Maryland to learn about, evaluate, and improve C-N-P management on their farms. We will conduct research at 20 farms and a long-term research station experiment to identify combinations of management practices, such as planting cover crops, harvesting cover crops for forage, and strategic use of tillage and manure injection, that optimize C-N-P dynamics to achieve high soil C levels while minimizing N and P losses. Pairing the dataset collected from research sites with a cropping system computer model, we will also identify region- and soil-specific benchmark soil organic matter levels that can be achieved under optimal C-N-P management. To supplement our education program of workshops, field days, and webinars, we will develop an online simulation tool for farmers to compare C-N-P dynamics under different management scenarios. allowing greater manure application rates and decreasing SOM decomposition rates. This project uses on-farm measurements of soil carbon, soil nitrate and ammonium, and soil test phosphorus (Mehlich 3) at multiple depths of the soil horizon (0-5cm, 5-10cm, 10-20cm, 20-40cm, 40-60cm, and 60-80cm) to assess how carbon (C), nitrogen (N), and phosphorus (P) dynamics are coupled. Soil measurements are paired with detailed soil management records to determine how the management practices are related to the measured C-N-P dynamics. By project completion, we will assess C-N-P dynamics on 100 fields from 25 different farms in Maryland, Pennsylvania, and New York. At each farm, roughly 4 fields will be sampled. Farms will be chosen to span a gradient of management practices from conventional tillage to long-term no-tillage, from manure use at various rates to fertility management purely with synthetic fertilizers, cover cropping and no cover cropping, and from simple to diverse rotations. Within each farm, fields will be selected for sampling that show some within farm contrast, such as phase of the crop rotation, cover cropped or non-cover cropped, different fertilizer rates used, etc. We expect the across and within farm variability to generate a broad spectrum of management practices that will allow results to be extrapolated to the majority of agronomic crop production in the northern Chesapeake Bay watershed. 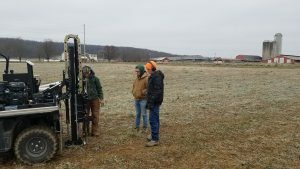 Soil sampling for each field will be conducted with a hydraulically powered soil probe (Figure 1, Ag Probe 9100, AMS, Inc.) that will retrieve a soil core to >80cm deep. Four cores will be collected from each field in random locations but all from within the same dominant NRCS soil map unit. The soil sampler retrieves each core inside a plastic sleeve such that the intact core can be removed from the sampling tube and transported to the lab while protecting soil horizonation and bulk density of the core. Following soil sampling, the plastic sleeves are cut open and each soil core is cut into depth increments of 0-5cm, 5-10cm, 10-20cm, 20-40cm, 40-60cm, and 60-80cm. The depth increments from the four cores taken in each field are composited to create a single sample per horizon per field. The total mass of fresh soil is recorded and a subsample is dried for determination of gravimetric moisture content. A subsample of the fresh soil is immediately extracted for nitrate and ammonium concentrations. Soil samples are then dried, flail milled, and sieved to <2mm. The rock weight in the sieved material is recorded to adjust the soil bulk density. Dried and sieved soil will be measured for Mehlich 3 extractable P and total soil organic carbon. Figure 1. A hydraulic soil sampler is used to sample cores to >80cm depth. Soil management practices that are documented for each field for the previous 10 years include the crop rotation, crop planting and harvest dates, average crop yields, crop residue removal practices, fertilizer and manure applications (include rate, form, time and method of application), and tillage practices. Management prior to 10 years in the past is documented in generalized form, including crop rotation, use of manure vs. fertilizer, and tillage practices. To date, one farm has been sampled in Pennsylvania. This farm was a large dairy farm with a corn-hay rotation. It has been practicing no-till for 20+ years and cover cropping reliably for 10 years. Four adjacent fields on the farm were sampled in December 2018, two fields during the corn phase of the rotation and two fields during the hay phase of the rotation. The corn fields had a cereal rye cover crop planted and the hay fields were dormant alfalfa/orchardgrass. Both fields had manure spread on them two days before soil sampling. Soil test results for nitrate, ammonium, and Mehlich 3 P are available for only two of the fields at this point (Table 1). We have plans to sample two additional farms in January 2019. Soil analyses will be conducted on the collected samples during the winter of 2019. We consider the first year of the project to be a pilot year for the soil sampling. On-farm sampling will significantly increase in years 2 (Fall/Winter 2019-20) and 3 (Fall/Winter 2020-21) of the project. Table 1. Mehlich 3 P, nitrate, and ammonium concentrations measured in the soil profile for two fields sampled in December 2018. Initial results show that soil test P is stratified at the soil surface in the long-term no-till fields on the sampled farm, however the overall soil test P levels are not excessive. In the plow layer, the soil test P levels are within or slightly above the optimum agronomic level according to Penn State soil test interpretation guidelines. Although this is a large dairy farm (1,000+ cows), soil test P levels have not accumulated to excessive levels because the farm has a large land base to distribute the manure across and manure P levels have been reduced through solids separation. Soil nitrate levels in the profile would be considered moderately low relative to previous experience sampling at this time frame. This may be because the farmer uses lower than recommended rates of N fertilizer on his crops, which he has determine are feasible without losing crop yield based on his experience using adaptive N management practices, such as nitrogen fertilizer rate strips. No educational activities about the project have been conducted so far. We are still working on developing a news release and a tool for tracking farmer contacts interested in the project. We expect to have a news release distributed and farmer responses to the news release completed by the end of winter 2019. We are still working on developing a news release and a tool for tracking farmer contacts interested in the project. We expect to have an e-mail list developed by the end of winter 2019. We were able to solicit interest from 3 farmers in having their fields sampled for the project in the Winter of 2019. One farm was sampled in December 2018 and two farms are scheduled to be sampled in January 2019. 3. 50 farmers attend an on-farm field day (November 2019) and 50 farmers attend a workshop (February 2020) Page 2 of 14 17 where they learn how C-N-P cycles are coupled, how to evaluate C-N-P dynamics on their farm with soil testing, and how to optimize C-N-P dynamics through cropping system management.